Salmontrader.com is a website connecting the world fish companies, fish growers and fish markets. 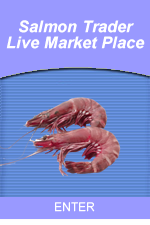 Salmontrader is the ONLY dedicated website that is exclusively devoted to fish and shellfish. There is NO other website like it. To view our Fish Import and Export advertisements, please click one of the SalmonTrader Fish Marketplaces below. Whilst every effort is made by the WIB Partnership to update and maintain this site, no responsibility can be taken for the contents of the advertisements of the trading pages or the contents of websites advertised via the banners.